Here are three ways to make your passing in volleyball even more accurate when your team is in serve receive. To control the ball and deliver it to your intended target you need to improve the accuracy of your forearm pass. Adopt the following three habits that professional players use and that we teach in our Boot Camp classes, in order to pass a higher percentage of balls to your setter. First, while waiting for the server to complete their pre-serve routine you need to check out the server's body position to pick up any cues as to where she could be serving. 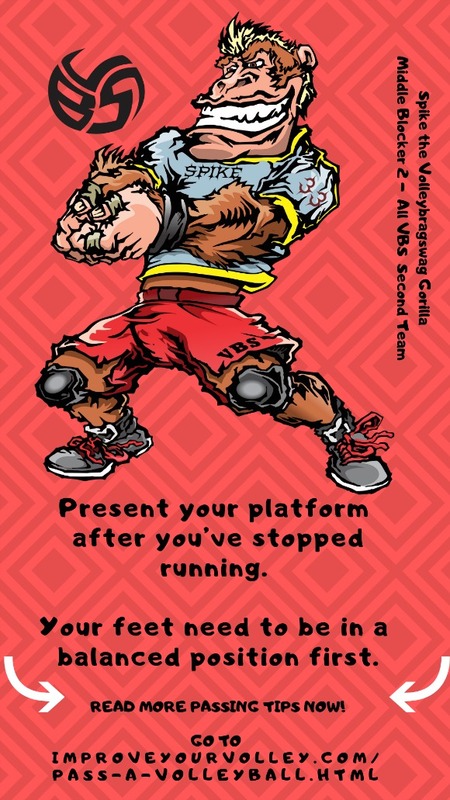 After you've checked out the server's body position and made your adjustments based on where it looks like the server is going to serve, then quickly share this information with your teammates. What can you communicate to your passers? "Hey watch the server, looks like she's going to serve short." "Hey you guys, stay low and be ready to move backwards looks like she's serving deep." It takes two seconds to say this very quickly to your other teammates before the opposing team serves. getting into the ideal position for you to forearm pass a ball based on what you've just called out. 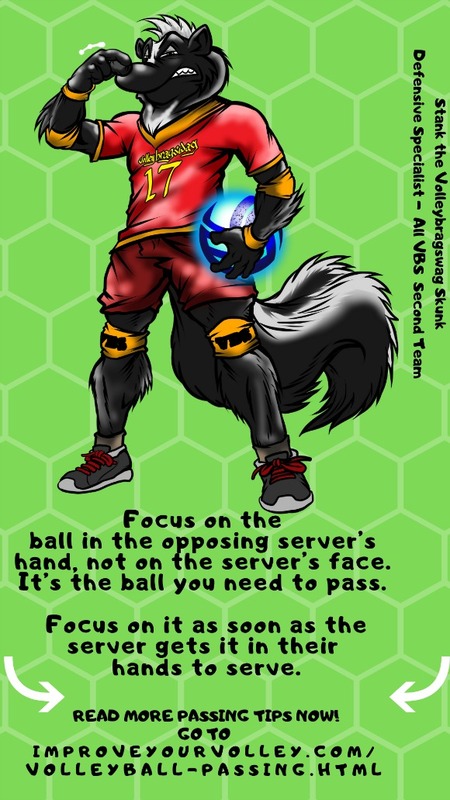 After the referee has blown the whistle, your focus should be completely on the ball while its still in the server's tossing hand. Once the server tosses the ball in the air for their pre-serve ritual there really isn't much they can change. 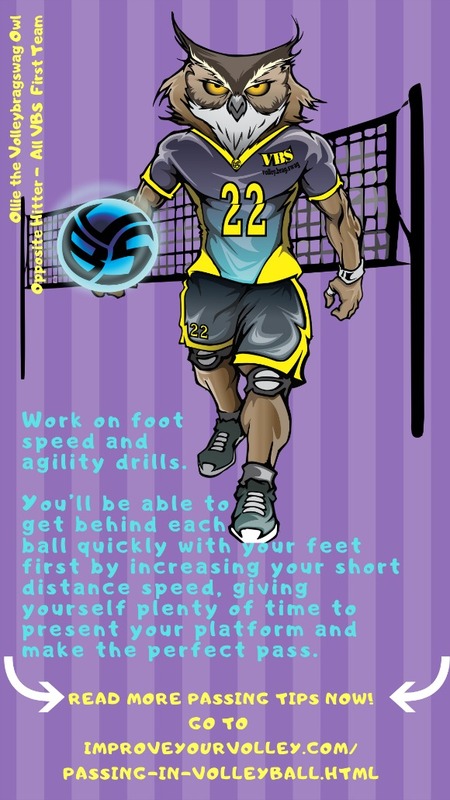 You should lock your eyes on the ball and visibly track it from the server's hands once she makes contact with it. Keep visually tracking the ball, keeping your eyes on it as it crosses the net and as the ball travels closer and closer towards you. When performing any forearm pass, you want to intensify your ability to focus on the ball as it comes from the server, into your court, all the way into the extended arms of your platform. You don't want to take your eyes off the ball even when it makes contact with your forearms while you are passing it. You want to watch the ball all the way into your court until it makes contact with your passing platform and then you want to keep watching the ball as it travels off of your platform and makes its way to the setter. Act like your eyes have a tracking device in them that won't allow you to take them off of the ball. Imagine that this tracking device is activated just before the server tosses the ball in the air for her serve, and continues tracking the ball all the way across the net into your platform and continued until the ball reaches the setter's hands from your pass. 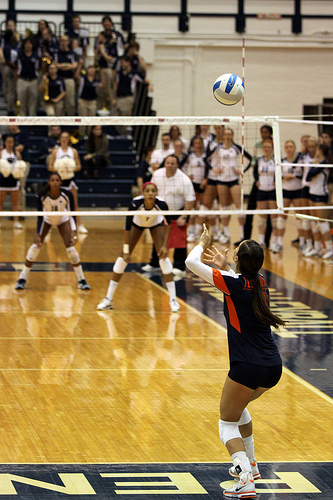 Collegiate and professional volleyball players have protected themselves against the effects of a fast moving floater serve because they watch the ball out of the opposing server's hands, so when it gets to the net and then crosses to their side it's easy for them to move their feet quickly to get into position to pass the ball right to the target. If you are late in getting positioned behind the ball then you have to do a better job of moving your feet and getting stopped behind it, so you have a better chance of controlling the ball to the target. When you are not positioned behind the ball, in many cases you have to swing your platform outside of your body to pass it. Advanced players work on passing technique during the Friday Night Advanced Skills Class at Veteran's Leisure Memorial from 5 - 6. 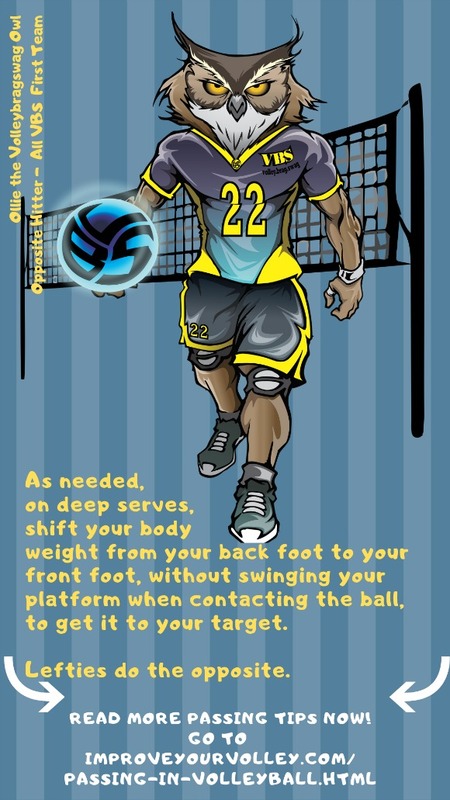 For those players who are just learning about passing in volleyball and haven't yet developed great body control or ball control skills, this usually means either your body will be off balance or you will end up using too much of your upper body to try and get the ball to the target. The lesson here is to avoid trying to do two things at once. What happens is that your forearm pass will become less accurate and it'll be harder to get the ball to your target, your setter. In most cases, the ball will go immediately over the net, which gives a free ball to your opposing team. Something you don't want to happen. Players should anticipate where the ball is going to land and move quickly to get to that spot first. 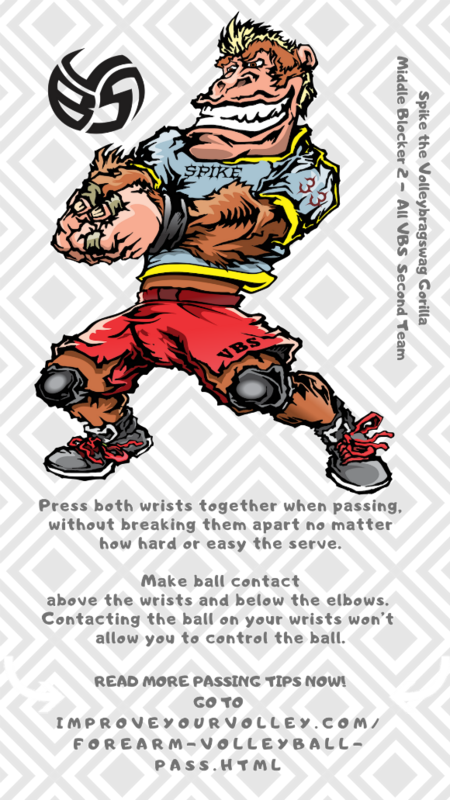 The passing action should be performed from a balanced position whenever possible. Wherever it looks like the ball is going to cross the net and land in your area, which may be only a side step or two steps away from you, you want to beat the ball to THAT spot. Then you want to try to be stopped so your momentum is not moving you forward. Ideally, you want to stop moving by the time the ball contacts your platform. 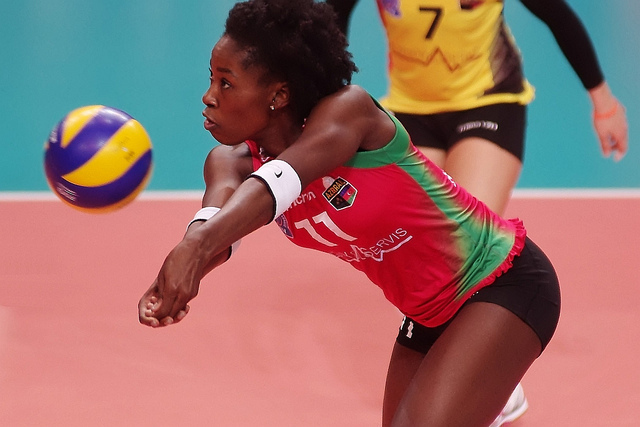 Your passing in volleyball will improve when you pass the ball making two separate and distinct movements. 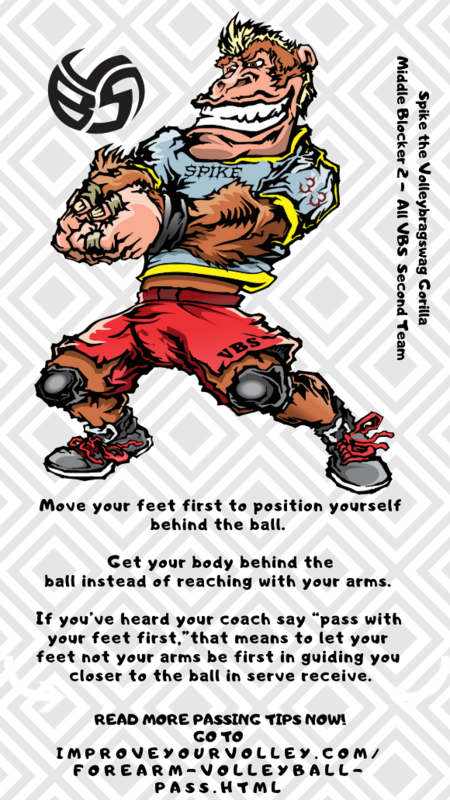 First you want to stay light on your feet so that you can run, shuffle or side step to get to where you anticipate the ball is about to land. Then your feet should be stopped, planted and balanced underneath you with your shoulders and body squared and parallel to the net. You then should quickly clasp your hands together, keeping your elbows and wrists pressed together and your thumbs pointing to the ground in order to form your platform. when you pass you want to stay very focused and concentrated on the ball starting when it's in the opposing team's server's hands and ending when it's bounced off of your platform and is heading to your setter's hands. 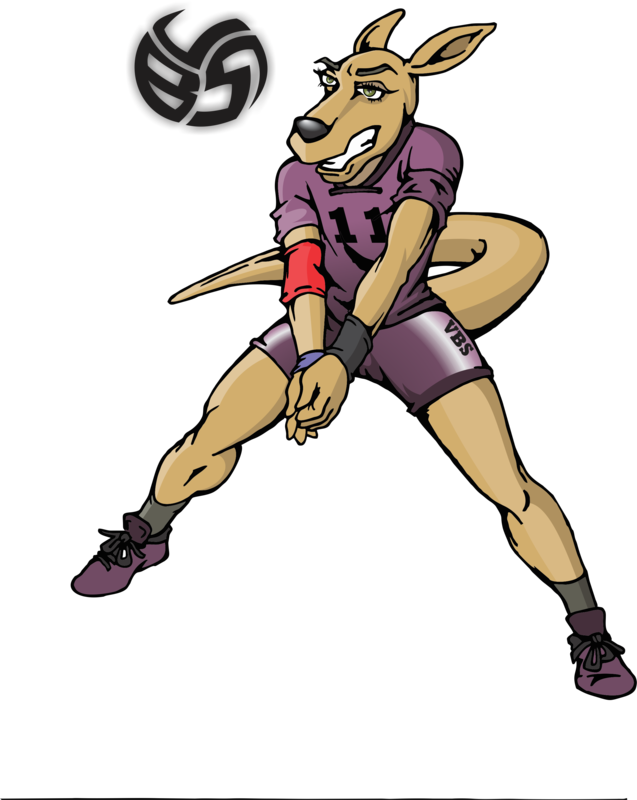 Remember, to pass a volleyball, you want to get to your spot quickly, beat the ball there, get stopped, form your platform, then make the pass. It does happen quickly, but as your forearm passing gets better by using this sequence, you'll see a marked improvement in your passing skills and your ability to get the ball to the target.